Ruger comes from a long line of gun dogs, so we’re making a gun dog out of him. In the hunting world, a gun dog is a hunting dog that responds when the hunter drops a bird. The term implies that the dog is used to working around guns and won’t be skittish at the sound of firing. In the search and rescue world, a gun dog is a dog that finds guns, or expended shell casings, at the request of police. It’s not well known that SAR teams work a lot of crime scenes. We don’t chase criminals, but we are frequently called to look for evidence and occasionally for bodies. Ruger is already nationally certified to find both live and deceased people. We’re adding what’s called “Gun Shot Residue” to his resume. Over the past few months Ruger has been finding progressively fewer shell casings tossed into grass. The eventual expectation is that he’ll be able to find a single shell casing in a 100’x100′ area, along with guns themselves. One curve ball is that we’re not allowed to have firearms at SAR trainings. That’s kinda like training a cadaver dog when you can’t have a human body in your freezer. So we work around this challenge by bringing gun parts that are dirty, but not bringing an entire functioning weapon. Not sure yet when we’re going to take our test, but we’ll keep you posted. It’s a frightening scenario for a dog walker. You’re admiring the birds or the trees or the sunset and you realize you’ve walked your dog into a scattering of broken glass. What do you do? If the dog is small enough, you can pick it up. But if that’s not possible then the next best answer is to just keep walking. The absolute worst answer is to start yanking on your dog’s leash in an effort to rush them out of the area. You might have noticed that dogs are different from people. They have four legs which means that if they’re just walking, three of those legs are on the ground. If they put the fourth foot down on something sharp, or hot, they can pick it back up. You or I, with only two feet, would fall over. The dogs do just fine. When the dogs don’t do just fine is when the handler starts yanking on the lead, disrupting their balance and forcing them to put a foot down where they don’t want to. If you see you’re in a pile of glass just slow down and if possible continue walking in the same direction. Avoid forcing the dog to turn which might spin them on a sharp edge. Once you’re safely out of the area check the dog’s feet for shards of glass that might have worked up between their toes. That could produce a cut later as the shard moves around. In the US, SAR dogs that work rubble “go naked.” Not only do they not wear booties but we remove collars and vests. We want the dog to be able to feel heat or sharpness with their feet, and we don’t want a collar or vest that might snag. My dogs have all worked rubble, including Magnum who worked the SR 530 Mudslide near Oso, WA. None has ever suffered a cut pad, even though they almost always end up on broken glass. As I said before, there’s never a perfect answer. But you can reduce the odds of a cut pad by simply taking a breath and continuing to walk, slowly, in a straight line. With the chance of more snow in the forecast, there’s probably still time for a product review I meant to do much earlier in the season. I’ve had the chance to use a couple of different traction devices for walking on snow and ice, and Katahoola Microspikes are the hands down winners. There’s another brand that was first on the scene, and like many “firsts” it was a great idea. But Katahoola has worked the bugs out, and their microspikes are the closest thing to crampons without needing to be on Mt. Everest. They go over your boots easily, and unlike “Brand Y” they stay in place. I found that the Brand Y devices have too big an opening between the straps at the front. That allowed them to slide back down the toe of the boot, eventually bunching up under my arch. The design of the Katahoolas prevents that. They’re priced at $69.95 at REI. REI also carries another version called NanoSpikes which look good, but which I haven’t tried. From the pictures, they might be a little more comfortable to walk on, with rubber soles and embedded studs, almost like a snow tire. If somebody has experience with them, speak up! Stay upright and Stay Found! I’m gratified that so many of you have asked for a sequel to Digger. I’m pleased to report that we’re in the home stretch of production. The delay was out of respect for you. Although I write fiction, I’m committed to making it realistic fiction worthy of your time. Without spoiling Digger, the solution to that mystery was easy for me to envision. But Bryce and Sierra are search and rescue volunteers. They can’t go flitting around town like Aurora Teagarden or Jessica Fletcher being busybodies. They’d get kicked out of SAR if they tried. The long-awaited sequel, Payout – The Scent of Money, was easy to write, but much harder to envision. Coming up with a mystery that could be ferreted out by a volunteer search and rescue dog handler took me almost a year. How’d I do it? By hiking with Ruger in secluded forests and just thinking “what if?” After months of “what ifs” I finally sat down at a keyboard and started cranking. Look for something in a few short weeks. Maybe the ides of March? Hope so. I’ll keep you posted on how to acquire your copy. It’s not about training the dog. It’s about training you. In today’s two-minute training, a quick read on how to properly reward your dog. Dogs work “in the moment.” A lot of us would be happier humans if we could do more of that, but with dogs it creates a challenging issue: How to make the dog realize the reward is associated with a behavior they just finished. If you’re too late, the dog will simply think you’re a wonderful person who gave them a cookie. Some experienced handlers whom I respect believe that a reward must be delivered within one second for the dog to associate the reward with the behavior. Some handlers use clickers, but you don’t always have a clicker in your hand. So get in the habit of saying “yessss” or “g’boy” when your dog gives you the correct behavior. Then follow up with the cookie. You should also practice this verbal “click” in a very soft, almost falsetto voice. During changed behavior, or even just while the dog is thinking, you can let them know they’re on the right track with a very soft “yesss” or “gooood.” If you speak too loudly, you’ll distract the dog and pull them off-task. But spoken just above the level of an exhaled breath can encourage them “in the moment” and lead them toward the desired behavior. Then, once they’ve done the whole enchilada, throw a party for the dog. 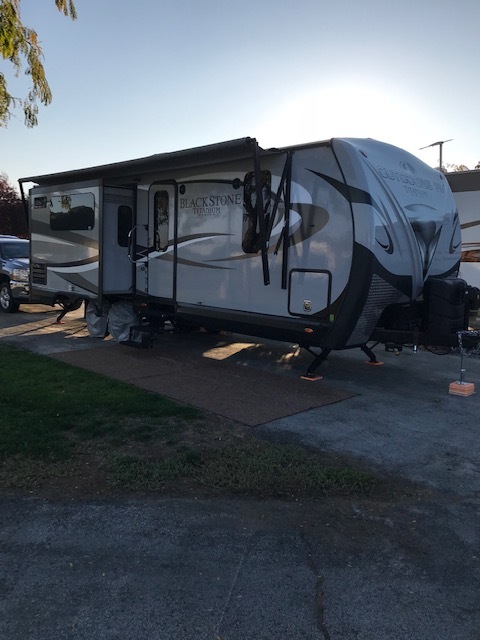 Our 2018 Outdoors RV 250RKS, with batteries! 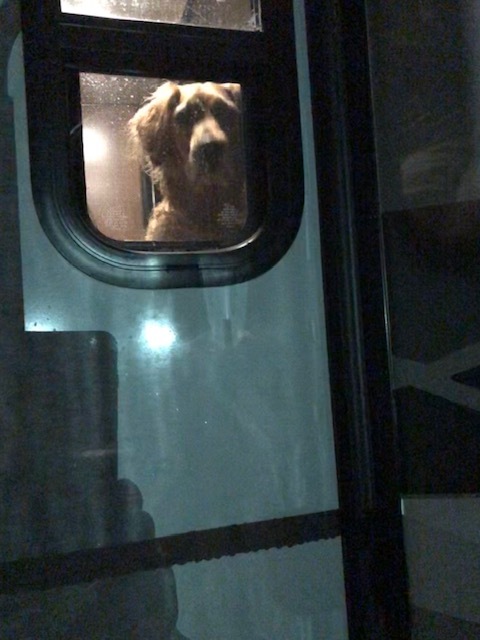 You’d think that in a travel trailer we’d be pretty self-sufficient if the power in our RV park went out. Well, you’d be right, but it wasn’t without some nail biting on our part. The story is a visit to Sequim for an author appearance with Ruger. An unexpected “mountain wave” windstorm blew up and over the Olympic Mountains, and right down onto the Sequim and Port Angeles areas. We only knew the power had gone out because the satellite TV receiver died. Everything else in the trailer is 12v, even the TV itself. The lights didn’t even blink. I tapped and banged on the receiver until it finally dawned on me why it didn’t work. So then, the worrying began. How long would our two 12v deep cycle batteries run the fan on the furnace? The furnace itself is propane, and we had plenty of that. But if the fan dies, the furnace dies. Ruger waiting patiently for my return from an excruciating long absence, to take out the garbage. The best part was that Ruger and I still did the appearance and demonstration. Our host received numerous calls from people planning to attend. “Is it still on?” Well of course. Probably 70 percent of our real searches are in the dark anyway, so no problem. And I suspect the event gave attendees a chance to get out of their own darkened homes for a little fun. We’d love to visit your group, school, church or community event. Shoot me an e-mail at robert (at) calloutpress (dot) com and we’ll get something set up. Aggressive Dogs Need Love Too. Smart Love. OK, so you’ve figured out your beloved puppy is turning into an adolescent dog that can’t get along with other canines. It’s aggressive or reactive every time another dog is in sight. That doesn’t mean you have a bad dog, but it does mean you have one that needs careful managing. This dog needs lots of love and consistent discipline around the house. If the dog is confident that you love and will protect it, then it will be far less likely to act out in public. I’d respectfully recommend asking your vet for the name of a good dog behaviorist and get a consult. But there are some things you can do inexpensively. And there are some things to avoid. Definitely give the dog lots of social experiences, within good reason, so it can become desensitized to things it might once have found threatening. Walking down a street with cars, people and other dogs can do wonders. That said, it’s one thing to walk your dog on a sidewalk or trail, letting it learn to be calm each time another dog passes. That’s dog, singular. Sequential positive experiences, with praise and a treat each time, can be effective. You don’t need to interact with each dog you pass. Just walk by and if your dog shows no reaction, then reward. But this is critical: make it one dog at a time. I was recently at a K9 related event with probably 50 dogs present in sort of a courtyard. An older gentleman arrived with a dog that was muzzled, and which was clearly overwhelmed and out of control. It was lunging and barking at every other dog present. It was in danger of pulling the older man down, possibly injuring him and causing him to let go of the leash. Finally, the muzzled dog really went to town on another pup, to the point that passersby had to intervene. I had to ask the organizers to exclude that dog from the premises. My fear was that he’d pull the man down, get loose, and attack whatever dog might be nearby. I will not put my dog in that position. Kudos to the man for trying to give an aggressive dog a positive experience. But this was horrible judgement. That particular dog should never have been in such an overwhelming environment. And here’s what’s worse: while the muzzle prevents bite injuries, it doesn’t stop the dog from trying to dominate or outright attack other dogs. The barking, lunging and canine body language still happen. So how many other fearful dogs did this animal create with its intimidating behavior? Bringing this dog to an overwhelming event didn’t help it, and risked creating reactive or aggressive dogs for other handlers to manage. Love your aggressive dog, but love it enough to be smart in how you handle it. You owe that much to your beloved-but-aggressive dog, and you owe it to other dog handlers as well.